Site editor’s introduction: Prior to addressing the Golden Bay Community Board and members of the public on May 13, 2014, Network Tasman Ltd’s employee Andrew Stanton was asked to supply answers to 32 written questions. (The initial 32 questions may be read at the bottom of this post.) Mr. Stanton initially chose to respond to only 16 of the 32 questions. These replies (which he re-numbered 1- 16, which does not reflect the original numbering) are below. The text supplied by Mr. Stanton is in standard font. I have made comments in response to some of the questions and these are in italics to distinguish them from the answers supplied by Mr. Stanton. On the same day that I published this post www.stopsmartmeters.org.nz/uncategorized/answer-the-questions-network-tasman-ltd/ Mr. Stanton provided more answers, and these will be the subject of a subsequent post. 1) How frequently will the “smart meters” transmit data about electricity use? I suspect that even if data about electricity use (rather than time synchronisation checks and other transmissions) occurs only every four hours, this will only be for a relatively short time as in Auckland at least one company advertises that their customers can check their electricity use every half hour, which means the “smart meters” for these customers must be transmitting at least every 30 minutes. 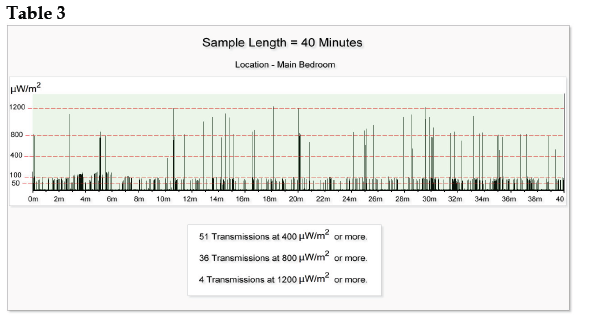 2) What is the duration of each transmission (of data about electricity use)? 3) Will the meters be organised as a mesh network? NB: When “smart meters” are organised in a mesh network, each “smart meter” communicates with at least one other “smart meter”, which can be expected to increase the number of times ach “smart meter” produces bursts of radiofrequency radiation (RFR). With a median exposure of 9,981 pulses of RFR per 24 hours, as above, this means that people in the vicinity of this type of meter are exposed to a median exposure of 6.93 pulses per minute. Or to put it another way, they are exposed to pulse of RFR from the “smart meter” every eight and a half seconds, or so. 4) If individual “smart meters” will act as a local hub, what is the number of other “smart meters” from which each hub meter will be receiving and transmitting data? This is difficult to predict due to the very nature of the mesh – but tests from operational meter systems in Australia show that over 99% of meters are transmitting for less that 1% of the time. While this may be true, this still means that people can be exposed to thousands of pulses of RFR every 24 hours, as shown in the table above. 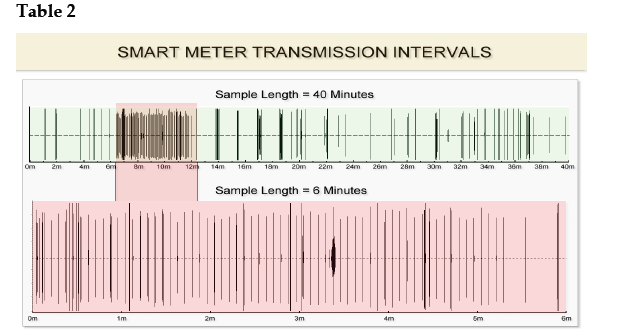 Please see the comments and the table and graphics below Mr. Stanton’s answer to Question 3 for a discussion of the significance of the median 45 seconds per day transmission time. 6) What is the duration of any non-data transmission signals sent by these meters? 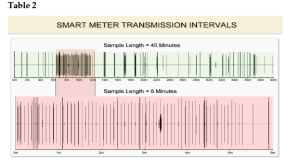 The median transmission duration that can be expected is 45 seconds per day, and this includes all meter data, time sync and network management transmissions. Please see the comments and the table and graphics below Mr. Stanton’s answer to Question 3 for a discussion of the significance of the median 45 second per day transmission time. 7) Regarding the “Smartco Relay and Access points” what independent testing has NTL commissioned regarding the RFR emissions from this infrastructure? If testing has been commissioned, please supply a copy of the report. Independent tests were carried out in 2013, there is a copy of the test report on our website. 8) Has NTL applied for resource consent for the relay and access points? If so, please supply a copy of the resource consent application and approval, if approved. Both the Nelson City and Tasman District Councils have provided Certificates of Compliance as our activities are covered under a National Environmental Standard, these certificates can be sighted at our offices. Why not simply supply a copy of these certificates rather than requiring people to drive to Network Tasman Ltd’s Nelson offices to be able to view these documents? 9) Do the Landis meters contain a ZigBee chip/unit? Yes but it is not enabled. My understanding is that for the type of “smart meters” Network Tasman Ltd wants to install, the default setting for the ZigBee chip is that it is not enabled. However I do not know how the ZigBee chip is “enabled”. Perhaps this could be done at the time of installation, or through the optical port on the “smart meter” or possibly it could even be done remotely. In any of these cases, if the customer were not informed that Network Tasman Ltd had “enabled” the ZigBee chip, the exposure of people in that home or business to RFR from the “smart meter” could significantly increase without their realising that this has occurred. 10) If so, how often will this ZigBee chip/unit produce RFR? “Consumers can set energy efficient appliances to interact with their advanced meter to alter usage to suit their lifestyle and manage electricity costs”. To the best of my knowledge a functioning ZigBee chip is necessary for the “smart meter” to be able to communicate with any “smart” appliances in the home. Clearly in the future, Network Tasman Ltd intends to enable the ZigBee chips – buit it doesn’t want customers to know how much additional RFR these chips will produce. 11) If the “smart meters” contain a ZigBee chip/unit will this continue to operate if the main transmission modem is removed? To the best of my knowledge, this is true. Many people choose not the use wireless internet and to keep their use of a cell phone to an absolute minimum, or not even use a cell phone. 13) Will NTL re-certify existing analogue meters which are in good working condition? Both NTL and the customer would miss out on benefits with a recertified analogue meter. This does not answer the question. Moreover, It is wasteful to discard meters that are in good working condition. 14) Will NTL [Network Tasman Ltd.] act as an MEP [Meter Equipment Provider] and install certified analogue meters for people for whom a “smart” meter (even with the transmission modem removed) is not an acceptable option? Our preference is to install electronic meters for all customers as it reduces the number of meters in service. This answer does not really answer the question. However, “smart meters” are considerably more expensive than new analogue (ferraris) meters so Network Tasman Ltd could easily a afford to buy a few more new analogue meters and spare its customers the risk from the additional RFR and possibly “dirty electricity” produced by “smart meters”. 15) Will NTL remove “smart meters” promptly on request if a customer develops new symptoms after a “smart meter” installation? The RF emissions from any meter are very,very low and only for a few seconds per day. If anyone does believe they are being affected by a meter we would work with them to investigate there concerns and find an agreeable solution. People would have more confidence in Network Tasman Ltd if it did give a firm undertaking to remove “smart meters” if customers developed new symptoms after a “smart meter” installation. As the coordinator for www.stopsmartmeters.org.nz I know of cases in which people have been made seriously ill by RFR from a “smart meter” at their home and have had to suffer for literally months because their electricity company has been reluctant to remove the “smart meter” – despite the customers disclosing serious symptoms to the company. 16) Will NTL remove “smart meters” promptly on request if a customer changes his/her mind and decides the health, privacy etc. risks from a “smart meter” is not acceptable? We would work with the customer to investigate their concerns and find an agreeable solution as both NTL and the customer would miss out on benefits with the removal of a meter. Electricity companies frequently state that “smart meters” have “benefits” for customers. However, a major US utility recently admitted that the “benefits” of “smart meters” are for the electricity company, not consumers who are exposed to increased levels of RFR from these meters, and for whom the introduction of time-of-use pricing after a “smart meter” roll out may significantly increase electricity bills .